On her first new studio album in five years, Austin’s Marcia Ball returns with three of her favorite things. The pianist/vocalist/songwriter has been delivering her signature brand of Texas blues, New Orleans R&B, roots rock, and Gulf Coast swamp pop for more than 30 years. The core six-piece band is kickin’ and the 15 guests are fantastic. Listen to their compelling interplay on "Watermelon Time." Throughout, they do not frustrate the listener with extended solos, but rather they pay strict attention to the songs as a whole, while Ball’s piano is superb. More than half of the songs are Ball originals. From the get go, an impression of the Gulf Coast is established thanks to contributions by Dr. John, Terrance Simien, and Wayne Toups. "Party Town" contains Ball’s trademark happy sound, which makes you feel good instantaneously. You’ll especially love the delightful rubboard and the jubilant L.A. Horns. Hopefully, the song will alleviate Hurricane Katrina’s pain, even if only for a moment, for residents of New Orleans. You won’t be able to resist getting up and joining the barn dance called "Married Life." It realistically depicts matrimony, and its contented melody features the burning slide guitar of Cindy Cashdollar. In lyrics like “Sure miss livin’ that life of ease”, the title track depicts fun memories of family cookouts. With a touch of voodoo, "Miracle In Knoxville" is a bit eerie. Musically, the song is in the vein of Otis Taylor but unlike Taylor, the lyrics are not dark. Here, exceptional performances are delivered by Ball (accordion) and Stephen Bruton (mandolin). Quite possibly, "Down In The Neighborhood" contains the best arrangement on the album. It is very lively and reflects all aspects of Ball’s Texas and Louisiana background. There are several beautiful ballads. The motivational "Where Do You Go?" (co-written by Tracy Nelson, who also appears on it) provides Ball the opportunity to competently demonstrate her friendly vocals and to provide a thought-provoking commentary on Katrina. The song is all about working hard and waiting for good things to come. The queen of ballads and boogies teams with Dr. John on "I’ll Never Be Free." Sounding better than he has in years, he plays organ while they both share the vocals. From soulful ballads to spirited party songs to sincere storytelling, this eclectic mix of 13 songs will please most adult palettes and it will spur them to get up and dance to the music. Perhaps those who preached about peace, love, and understanding had it wrong all along. BBQ just might be the third critical component needed to restore world order. We all know downhome cookin’ brings out the best in people. All jesting aside, this CD’s underlying message is about determination, persistence, and faith. 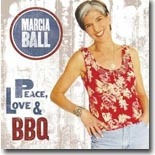 On Peace, Love & BBQ, Ball innately possesses these qualities and instills them in her listeners.